Picture this!! Warm summer day, husband armed with camera, wife wending her way through the overgrown graves of the country cemetery of Braidwood in the Southern Highlands of New South Wales. “Oh we should get a picture of this one” she calls, as her husbands, wipes the sweat from his brow, brushes away the flies and snaps another picture of an old crumbling headstone. Yes my husband laments as he tells this story to sympathetic friends. The trials of being married to someone who is constantly on the look out places to research the family tree even if it means tramping through long grass and avoiding the insects, spiders and snakes who have made the local cemetery their home. This story leads me to my next post for the on Friday's Family History through the Alphabet Challenge , for the Family History Through the Alphabet Challenge. 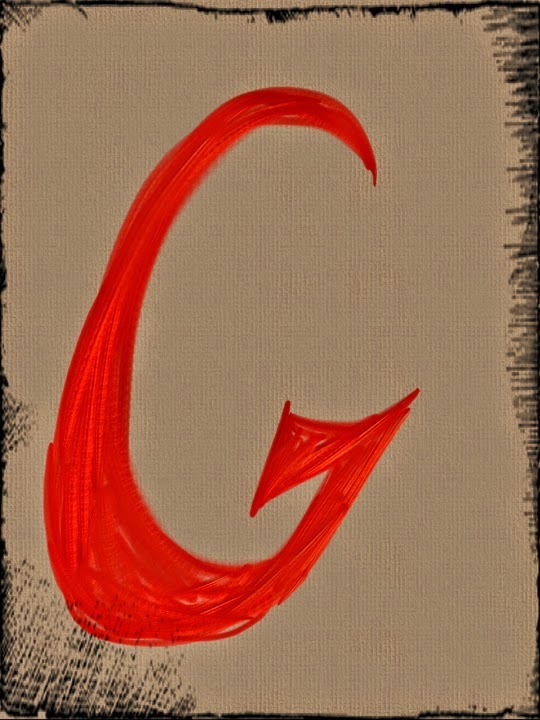 G is for Gravestone!! I guess there are many families who have someone who likes to wander amongst gravestones searching for information on passed relatives. In pre-internet days I found searching cemeteries a most valuable resource and much to my children’s dismay would plan a family excursion or holiday around the possibility of being able to check out the local cemetery for further clues. 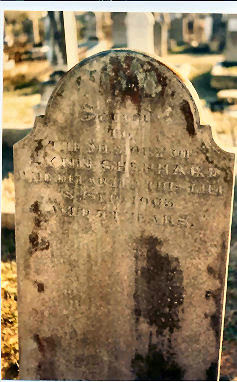 The gravestone, or headstone, or tombstone is a grave maker. It can be made of stone, marble or in the cases of those without sufficient funds it could just be a small wooden cross. The gravestone not only marks where our ancestors were buried, it is a memorial to past family members and it's inscriptions can provide information on the deceased name, date of birth and death, names of family members who mourn them and possibly a small quote that will give some indication of their personality, or standing in the community. Often a number of family members a buried in the same grave or in close proximity to each other, thus providing information of family links and relationships. While researching information on gravestones I came a cross a quote that describes the importance of graveyards as a place for research, "Graveyards are outdoor museums and the most accessible source for studying the local community and its history.". If you are just starting to research your family, a visit to the local cemetery is a great way to begin your search. The local cemetery, or cemetery of the town that your family came from is one of the most accessible sources of information on local history and our heritage. The inscriptions on the gravestones contain information of generations of families, with details of their relationships, friends, neighbours, tragedies, religion, occupations and memberships of different societies. The size, and more elaborate gravestones may also indicate the status or wealth of a family member. 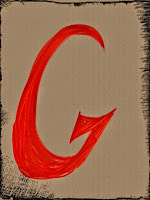 To finish this blog on "G is for Gravestone" I would like to share with you two of my favorite gravestone pictures. 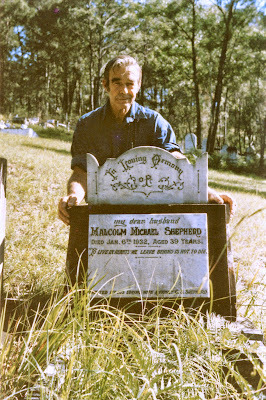 The first was taken on the day (mentioned above) that my husband and I traipsed through the Braidwood Cemetery and found the grave of my Great-Great Grandfather Lynn Shepherd II and the second one is taken thirty years ago, when I visited the cemetery in Nelligen with my parents and took a photo my father standing behind the gravestone of his father and my grandfather Malcolm Michael Shepherd.